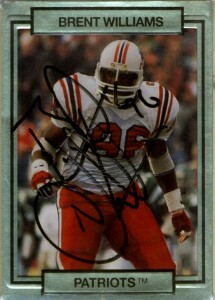 Defensive lineman Brent Williams was drafted in the 7th round of the 1986 draft by the New England Patriots out of the University of Toldeo. He’d be a nice budget buy for the Patsies, playing 8 seasons for them primarily in the team’s 3-4 alignment at defensive end and some spot time at nose. His rookie season would be a strong one, making 7 sacks, 4 fumble recoveries and 73 tackles. He’d continue to make an impact for the team along the line, making a career high 8 sacks in both 1988 and 1989. 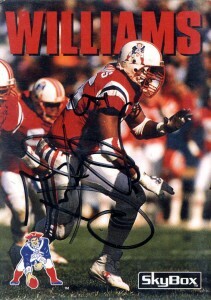 Williams would play for the Patriots through 1993 as he’d see a heavy role as a back up in his final season. Brent would sign with the Seahawks in 1994, playing with them through the 1995 season making 38 tackles, 2 sacks and 2 fumbles. In 1996 Williams would play with the Jets in a backup capacity suiting up for 5 games and retired at the conclusion of the season. Since football Brent Williams has applied his degree in business administration going into the financial arena, working as a Financial Advisor with a good portion of his clients being former NFL players. He’s spent time working in Pop Warner football and girl’s basketball, and cheers the Patriots on to this day.